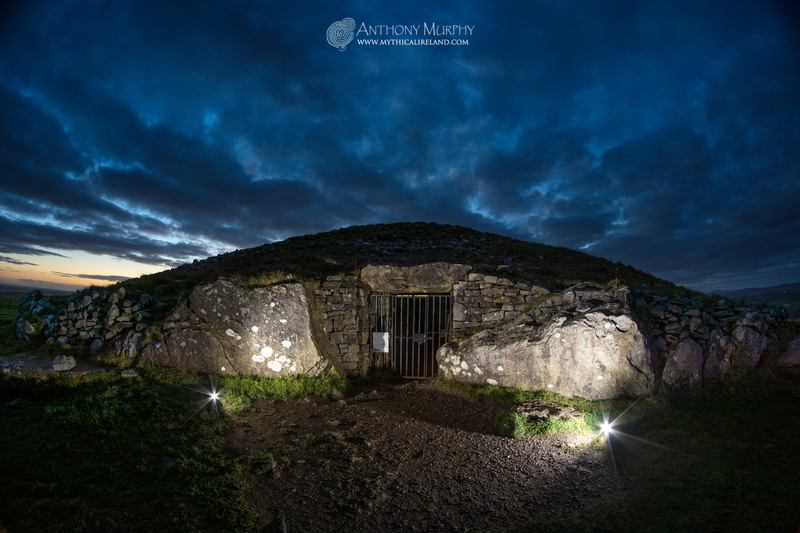 I spent a beautiful evening out at Knowth and Newgrange in the Boyne Valley after sunset this evening. It was cold, but clear, and the colours in the fading twilight were absolutely beautiful. The above photo shows something I have never captured before, and was delighted to get on camera. 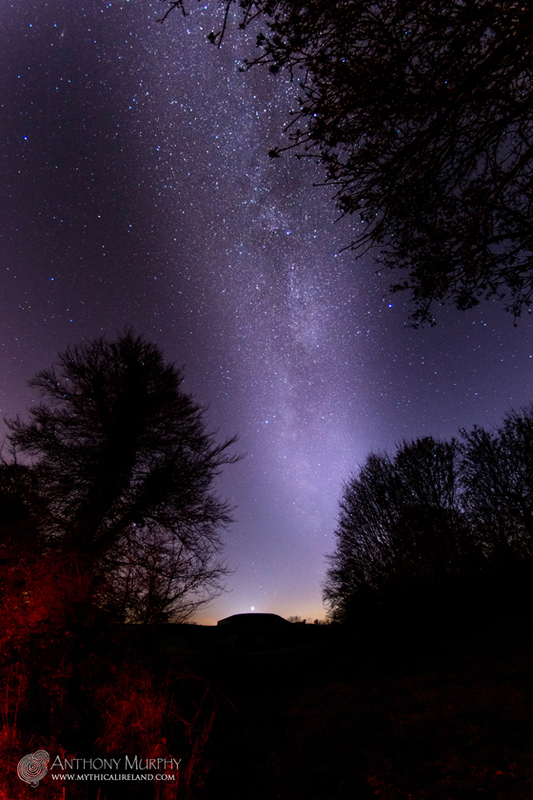 It shows the bright band of the Milky Way over Newgrange. It also shows, sitting just above Newgrange and about to set behind it, The Evening Star - Venus. I had been in the Boyne Valley for over an hour after sunset, from around 4.30pm. Venus was easily visible in strong twilight and I got several photos of it with Newgrange. But just as I was about to drive away to go home, I stopped at this viewing location and could see that the Milky Way was visible. So I jumped out of the car (which was still running) and put my 8mm wide angle lens on the camera and quickly set up for a 25-second exposure. It was very cold out - just 2 degrees celcius - and my fingers were numb from all the standing around over the previous hour and a half. However, this shot, taken at 5.53pm, was well worth the effort I think. I'd safely say that's the earliest time after sunset that I've ever taken a photo of the Milky Way. And I'm glad I did. I drove home with a big smile on my face. Five minutes later and Venus would have disappeared behind the ancient mound of Newgrange. It's nice also to have captured a photo of the Milky Way above Newgrange. In ancient times, the Milky Way might have been known as Bealach na Bó Finne, the Way of the White Cow, and the goddess who was venerated in the valley and who gave her name to the Boyne River was Bóinn, the White Cow goddess. It's likely that the Milky Way was seen as a heavenly reflection of the Boyne. For a long time, I have been studying, writing about and talking about Irish mythology. During that time, I have tried to relate the importance of mythology as something beyond mere story telling. It appears to me that our myths, no matter how ancient, seem to have a relevance to us even in the present day. In previous works (including my books and blog posts), I have attempted to bring that relevance to bear upon modern life. It can be a difficult thing to do. There's always a danger that people think you're engaging in some sort of new-age mystical "woo", so I tend to be very careful about how I approach the whole area. I have a great enthusiasm for the subject matter. The Book of the Cailleach. Recently, on the recommendation of a Facebook friend, I purchased a copy of a book called 'The Book of the Cailleach - Stories of the Wise-Woman healer' by Gearóid Ó Crualaoich. Having seen a number of posts I had written featuring words and pictures about the Loughcrew cairns and the story of the Cailleach who is said to have created them, this follower thought that I would be interested in Ó Crualaoich's book. And they weren't mistaken. So far, I have found it absolutely gripping. It is a comprehensive analysis and discussion of the stories from Ireland's oral traditions about the 'wise woman', the 'hag', the Cailleach, or the 'Red Woman'. These stories have their roots in pre-Christian Ireland. The book's blurb says that, "In the hands of Gearóid Ó Crualaoich these figures are subtly explored to reveal how they offered a complex understanding of the world, of human psychology and its predicaments. The thematic structure of the book brings to the fore universal themes such as death, marriage, childbirth or healing, and invites the reader to see the contemporary relevance of the stories for themselves." "The unearthing of a priceless spirit from forgotten, buried, misunderstood storytelling is like discovering Knowth or Newgrange and opening the doors to those otherworlds. 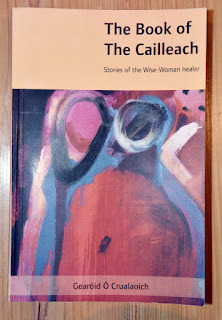 Gearóid Ó Crualaoich's work on the wise-woman healer, the cailleach, is of immense importance, for we need access to the secrets of healing and orientation in life known well in the past but now neglected. Without that secret knowledge we are left with mere rationalism and secularism, which are inadequate for dealing with the challenges of a complex world. This book is highly professional, comprehensive, carefully interpretive, and respectful. It opens up many avenues towards the healing of our own personal lives and our world. 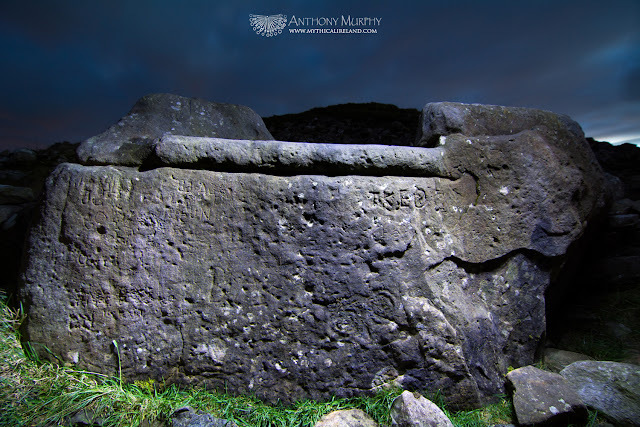 It is of special importance to Ireland, but it also addresses the needs of people around the world, who can now look to Ireland for the rediscovery of a special kind of spiritual knowledge connected to the natural world, to place, and to history. This book is so rich in detail and implication that it can be taken by the reader as a personal map to the otherworld and to the forgotten powers of nature and humanity now accessible to him. To women especially it offers an image of strength, wisdom, and healing power. We need this kind of excellent work, visionary as well as academic, all over the world to pull us out of the literalistic and materialistic vision that is limiting us and perhaps even killing us." That review was by Thomas Moore, author of Care of the Soul and The Soul's Religion. "It returns to Irish folk material the emotional depth and imaginative meaning which it always contained in its natural context but of which it has often been stripped by the more utilitarian and commonplace interpretations long in fashion. It reminds me once again why I am charmed and enchanted by this material, and more than that, why I regularly find in it answers to the deep-seated obsessions of my own. A real gem of a book, containing an exemplary methodology showing how the Irish folk tradition can be interrogated to find answers which are vitally important to our age and times." I've spent quite a bit of time at Loughcrew, exploring the monuments and landscape of the Cailleach. Bringing to bear the meaning of myth has become one of the most appealing aspects of my work. But this wasn't always the case. The reason I began to study the monuments of Brú na Bóinne almost 20 years ago (in reality, I had been studying them since I was a child, when my father brought home George's Eogan's newly published book on Knowth in 1986) was more to do with a belief that astronomy had a greater role in the design and interpretation of these great monuments than was being expounded by the experts. However, having begun serious research with Richard Moore in 1999, I decided just over a year later, on the 16th of March in the year 2000, to establish a website which would discuss aspects of our researches. When it came to choosing a title for this website, I quickly (and without giving it too much thought to be honest) decided to call it Mythical Ireland. Why? I wasn't entirely sure then. Perhaps I acted out of some instinct. Whatever the reason, over time, myth has become the most important aspect of my work. And that's because, for me, personally, the retelling of our myths has led to revelation. Ní Dhomhnaill is right. The interrogation of our folk and mythic traditions leads to answers which "are vitally important to our age and times". 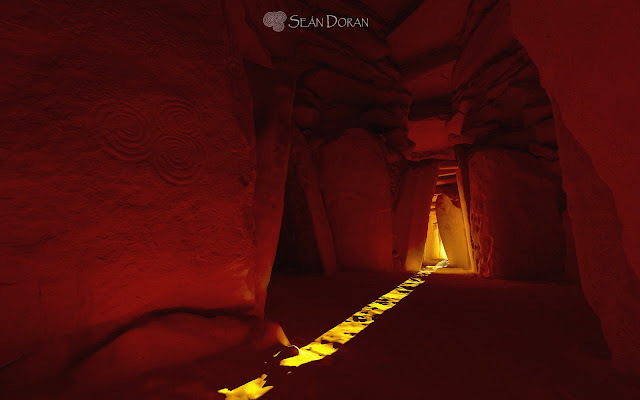 Some incredible images and videos have been created from 3D imagery of the inside of Newgrange. This artist's impression uses a 3D model, created by the Discovery Programme, which allows us, virtually, to be inside the monument. Using this imagery, Seán Doran has recreated the solstice illumination of the chamber, and it's beautiful. This gives a good idea what it's like to be standing in the chamber on winter solstice, something only the winter solstice lottery winners can usually do. The lighting simulation, according to Sean, is a "brute force Global illumination solve for a light source passing across the roofbox". So the result is accurate in terms of the way light would flow into the passage and chamber, but not necessarily fully accurate in terms of the intensity of light or even the colour. At this stage, the model is completely untextured. That's why I can't wait to see further results! Here are some still images from the render. We are very keen to keep an eye on Seán's work as it progresses. There is a huge amount of valuable research going on in relation to the megalithic monuments using very modern technologies. We are, effectively, being allowed to look at monuments in a whole new way. A view from the rear recess of the light streaming into the chamber, with the triskele visible in the glow. In these simulations, the famous triskele (tri-spiral or triple spiral) emblem carved into the side stone of the rear recess of the chamber is made visible in the glow. The folklore of Newgrange once suggested this would happen. The computer imagery puts us right there inside Newgrange. You can find some of Sean's imagery on his Flickr page here. You can see some of the Discovery Programme's 3D models of Irish monuments here. Brownshill (aka Kernanstown) Dolmen, Carlow, Ireland. A relic from our Neolithic past. I love the irony of the winter wheat just peeking above the ground, a harking back to the singular reason that Neolithic man is so close to our hearts. The first forests cleared, the first ground broken, the first crops grown and harvested. Brownshill Dolmen, Co. Carlow. Picture © Lar Dooley. The great seismic change in our gene pool, the change from hunter gatherer to sustained farming began a change in our lifestyle that has led to the birth of civilisation, as we know it. Suddenly man had a foothold on the Earth, one of his first tools used in cutting down forests and planting the first crops. The industrial evolution began, in reality, with the Quern, and the ability to begin to process food. The great development of stable living and industry allied farming and subsistence living and changed our landscape forever. The first permanent dwellings, the first monuments to the gods, the first celebrations of solar and lunar alignments, the first industrial processes for milling corn and storing crops and farming output, drove us to become sedentary beings. Brownshill Dolmen is presented with respect, and protected by a fence. Picture © Lar Dooley. The monumental efforts required to build our Dolmens, our court tombs, our passage chambers and our great ceremonial spaces gave us the basis for religion, industry, civilisation and modern living, and yet we, or at least some of us, see Neolithic man as an ancient pagan relic, as distant from us as the great Neanderthals who emerged from the Ice Age. Perhaps it is time we paid homage to these great people, who forever transformed our landscape, who gave us the spiritual blessings of a life well lived, who left us structures we would find difficult, if not impossible to build today, without the benefit of our great mechanical construction monsters, on which we depend today. 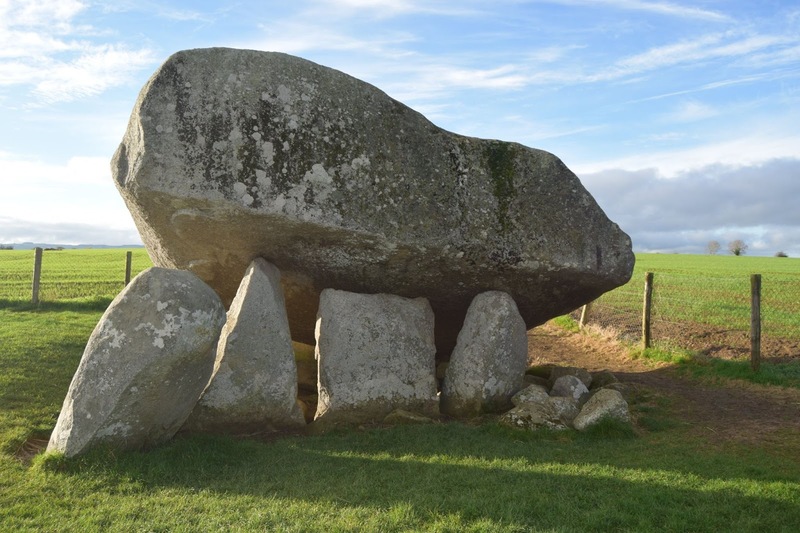 The cap stone of Brownshill Dolmen weighs about 150 tons. Photo © Lar Dooley. To simply raise the capstone of this ginormous monument to early man's ingenuity, its 150-ton-plus weight, would take all of our scientific and mathematical prowess, allied to the efforts of a combined force of many human hands, and yet, here it stands, a proud, untouched advertisement to those great achievers, our ancestors. This dolmen is one of many treated with dignity and respect. A pathway travels round the perimeter of the field, and crosses to a spacious fenced off area situated almost centrally in the pristine fields of corn. 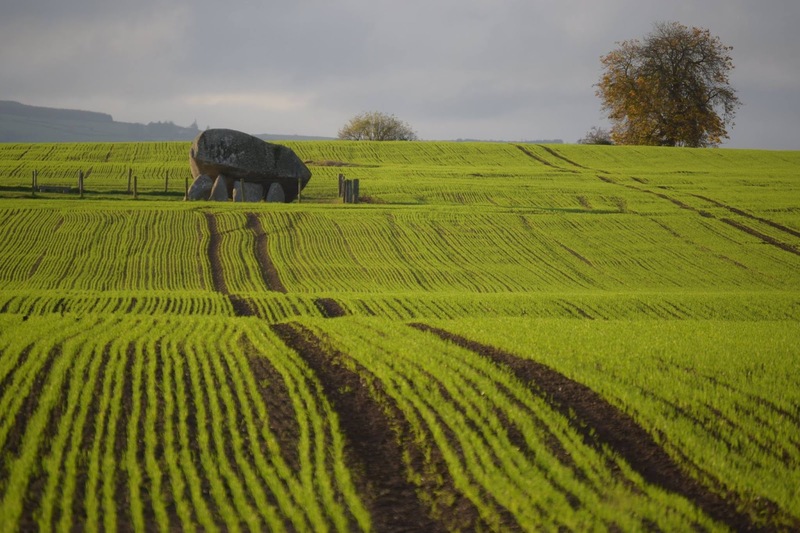 This gives the viewer an unspoilt view from both close up and afar, and brings the monument from an ancient sphere, to a modern setting, which benefits both the farmer and the viewer. 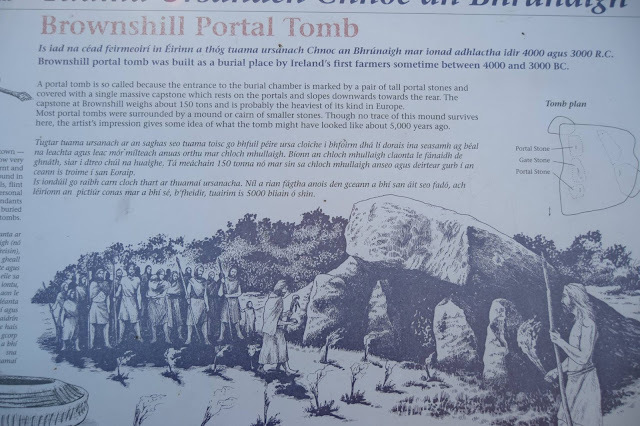 Information about the Brownshill portal tomb from the sign at the site. Picture © Lar Dooley. Would that every ancient monument had such ease of access, and such a pristine view. However, the plodding across fields and up hills also has the beneficial aspects of monuments in unspoilt landscapes, and the benevolence of being left untouched by those for whom respect is a word rarely understood, and less venerated. This is the so-called Hag's Chair at Cairn T, Sliabh na Calliagh, Loughcrew. Although it is part of the kerb of the cairn, it is unlike any other kerb stone on any Irish passage-tomb. We know very little about it, except what myth and folklore offer by way of mysterious and vague explanation. Amid all the more modern graffiti, some of the really ancient carvings can still be seen on the Hag's Chair. The Cailleach (or hag/witch/crone/goddess) of Loughcrew is ubiquitous on these hills. The story of the cairns is the story of this ancient figure of mythical intrigue. The creation myth of Loughcrew (for that is how it can be best described) suggests that she built the cairns, somewhat haphazardly, by dropping stones from an apron of stones as she jumped from hill to hill. She is said to have come from the north, which is interesting, because towards the northern aspect we find the rounded mountain of Slieve Gullion in Armagh - another place associated with the Cailleach (who goes by different names) and has a passage-tomb on its top which has a passage that points towards Loughcrew for winter solstice sunset. Cairn T at Loughcrew, also known as The Hag's Cairn. It's interesting that she has several different names - Cailleach Bhéartha (Cally Vera), Evlin (Eibhlín), Garvoge and even Tailte. The hills also go by different names. Carnbane (carn bán) is the one we know today as Carnbane West. In one version, it is called Carnmore (from carn mór, the big cairn). Indeed, the largest cairn in the whole Loughcrew complex, Cairn D, is on Carnbane West. Carrigbrack, which does not feature in some versions of the creation myth, is from carraig (stone) and breac (speckled), thus "speckled rock", but is also known as Sliabh Rua (Red Mountain), for which there is a very obvious and fascinating astronomical reason connected with local alignments. Sliabh na Calliagh (also anglicised as Slieve Nacally) is, apparently, also known as Carnbeg (carn beag, the small carn). Although because there is a middle hill called Loar, one wonders if Loar was Carrigbrack or Carnbane East, possibly making Patrickstown Hill the Carnbeg of the variant. More research needed here I think! 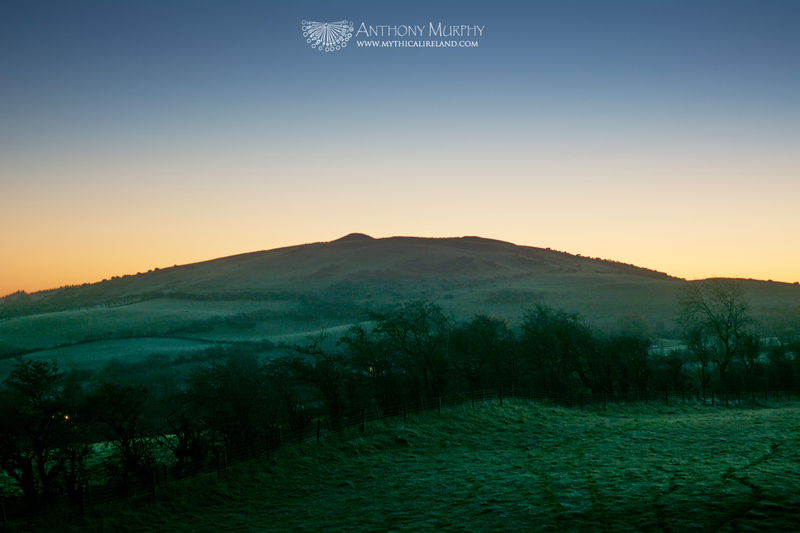 Sliabh na Calliagh, crowned by the Hag's Cairn, in the dawn sky, viewed from Carnbane. Wont as I am to engage in speculation, I have often wondered if the story of the old hag dropping stones as she leaped from hill to hill is not in fact related to the movements of the sun, moon and the stars somehow. We know that several cairns point to other cairns (Cairn L points to the cairn on Carrigbrack, for instance; Cairn I points to Cairn T, etc). Is the cailleach the moon? 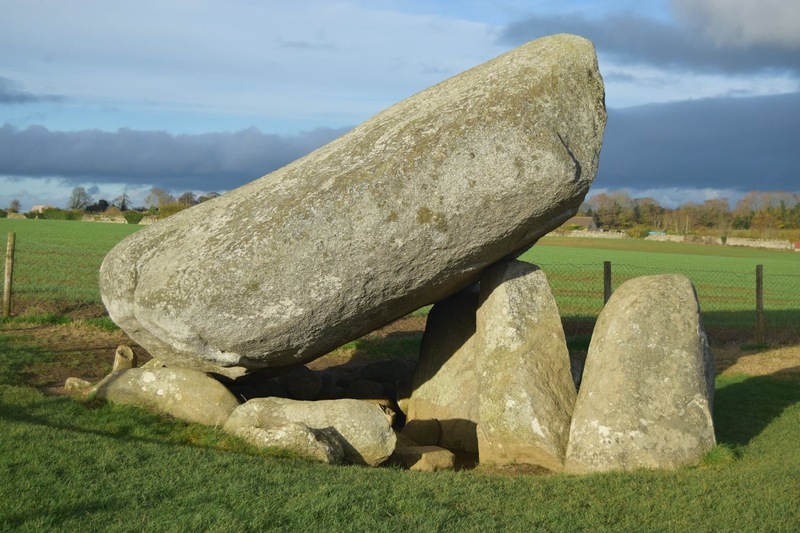 We know from research into the Boyne Valley monuments that Venus (the Morning Star) was known as caillichín na mochóirighe, meaning "early-rising little hag"(5). It is tempting indeed to view the moon, with its darker areas, as an apron or bag full of stones. As she drops the stones, the moon becomes smaller, until it fades to a slender crescent into the growing light of morning, before eventually disappearing (in the east) as the dawn comes. It is possible also that the cairns might mark out various important lunar risings and settings which mark out its course through the sky during the 18.6-year rotation of its nodes. Observation of this cycle leads to the observation of lunar standstills and the prediction of lunar eclipses. Martin Brennan and his team of researchers (including Jack Roberts) made several important discoveries at Loughcrew in the 1980s, showing certain astronomical alignments. They made several observations of lunar events. It would be nice if this work was followed up. In the fullness of time, a greater story about the astronomical complexity of Loughcrew might emerge. And, perhaps, a "solution" that cracks the meaning of the myth of the Cally Vera. Until then, we can only suggest that some day this ancient queen might return, and claim her throne once more. (1) Conwell, Eugene, On Ancient Sepulchral Cairns on the Loughcrew Hills, Proceedings of the Royal Irish Academy Vol. 9, p.357. (3) From John O'Donovan's Ordnance Survey Letters (Meath). (5) Murphy & Moore (2006), Island of the Setting Sun, p.167. 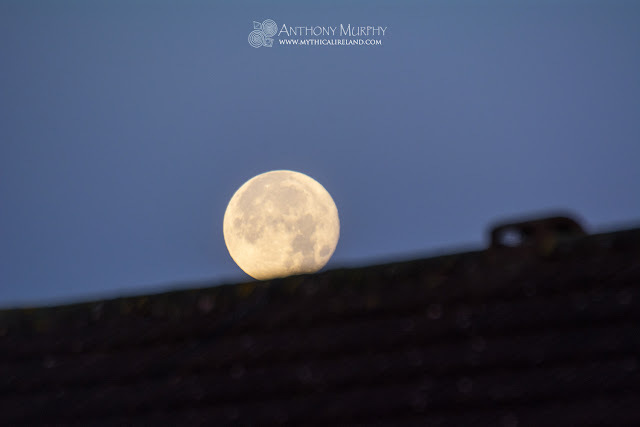 This is a video showing a live broadcast I did on the Mythical Ireland Facebook page today about tonight's Super Moon. The Super Moon refers to a full moon that appears bigger and brighter than normal because the moon is full and at perigee - its closest approach to earth. This was the biggest full moon visible since 1948, and although there are regular "super moons", this was rare because of its proximity and its relative size - 14% larger than normal and up to 30% brighter. In the live broadcast, I discussed the possibility that super moons were noticed in the Neolithic, at the time Newgrange was built. Viewing the moon from the chamber, through the roof box, would enable ancient observers to see the relative size of the moon in relation to the "frame" of the aperture - and therefore they might be able to discern changes in its relative size. The setting Super Moon on the morning of November 15th, shortly before sunrise. There is a full moon every 29.5 days - a period we call the Synodic Lunar Month. The super moon on December 14th will also be big, but not as big as tonight's one. In case you are not a follower of Mythical Ireland on Facebook, you might be interested to know that I did a live broadcast from Carnbane West at Loughcrew around Samhain, where the light of the rising sun cast its beams into the chamber of Cairn L. Above is a video of that live broadcast. Standish O'Grady was the son of a protestant clergyman who ironically became part of what has become known as the 'Gaelic Revival' literary movement. Despite his belief that Ireland was better off as part of the United Kingdom, O'Grady's writings as a scholar of Gaelic mythology, Irish history and his works of fiction, inspired those who thought otherwise. 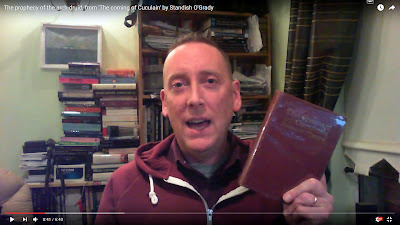 'The Coming of Cuculain' is a historical novel, based around the story of Sétanta/Cúchulainn that we might be familiar with from the manuscripts, but obviously heavily embellished as a work of fiction. Nonetheless, it is very enjoyable. It was published by The Talbot Press in 1894. It features an introduction by A.E. (George William Russell), one of the leading figures of the Gaelic Revival. 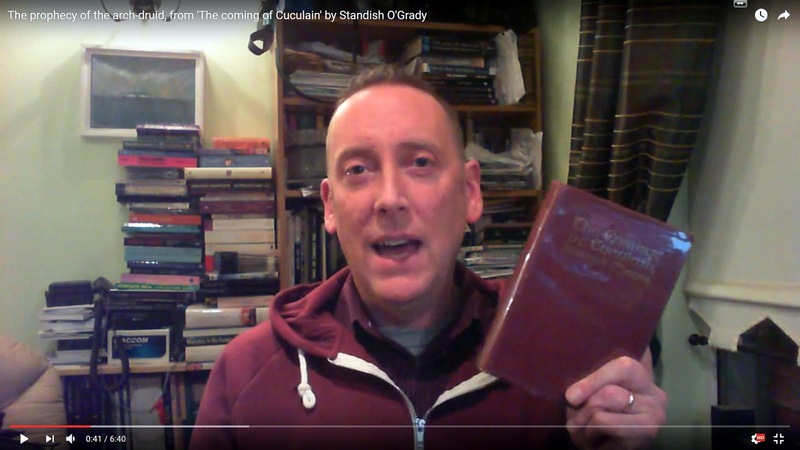 In the video, I am reading from Chapter 1, The Red Branch, where the ard-druid, Cathvah, makes a prophecy concerning the coming of the wonder child. It is dramatic and poetic, and biblical in tone. Many mythologies around the world contain narratives concerning the prophesised coming of some sort of hero or warrior or saviour. In this case, the subject of the prophecy is Sétanta, the boy who will eventually kill the hound of Culainn to become the warrior Cúchulainn, who leads the Ulster warriors against Medb's Connacht army. "Yea, he is coming. He draweth nigh.  The star that is to shine for ever upon the forehead of the Gael. Like a star upon Slieve Fuad. And the whole mountain is filled with the Tuatha de Danan." 'The Coming of Cuculain' read by Anthony Murphy. The hill at Loughcrew known as Carrigbrack might be the least famous of the four hills* upon which the Cailleach of ancient times was said to have built a scattering of cairns. Today, it has the remnants of just one passage-tomb on its top, and is somewhat forlorn. However, it has another name - Sliabh Rua - meaning "red mountain". Following a weekend of observations on the hills of Loughcrew, it's now really clear why it had that name. Samhain sunrise over Sliabh Rua viewed from Cairn L on Carnbane West. When the sun rises at dawn on the ancient festival known as Samhain, the halfway point in days between autumn equinox and winter solstice, the sun rises out of the breast of Sliabh Rua and immediately its light shines into the chamber of Cairn L on Carnbane West. Its light dramatically strikes a bright, slender limestone pillar in the chamber. Standing outside the cairn, looking at the dawn sky, one cannot help but look and see Carnbane East (topped by Cairn T) and Sliabh Rua (topped by the remains of an old cairn) as the breasts of the hag. This evening, I went back to Loughcrew. This time, I went to Slieve na Calliagh (Carnbane East) to see if I could determine where the sun goes down on Samhain as viewed from the Hag's Cairn (Cairn T). To my delight, it was a beautiful evening and the sun and sky put on a dazzling show for my camera. 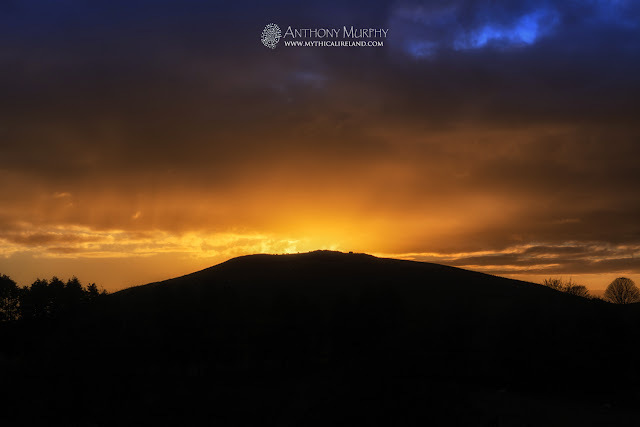 And as it sank down towards the horizon, I could see that the sun was setting over Sliabh Rua/Carrigbrack. It was easy to see from the resulting light show how that hill might have got its name - red mountain. Samhain sunset over Sliabh Rua viewed from Slieve na Calliagh near Cairn T.
The higher elevation of Slieve na Calliagh means that one is looking "down" at Sliabh Rua for the sunset, whereas because Carnbane West and Carrigbrack/Sliabh Rua have the same elevation, one is simply looking horizontally at the sunrise. (Cairn L is at 236m above sea level; the cairn on Sliabh Rua is 237m and Cairn T on Slieve na Calliagh is 258m above sea level). 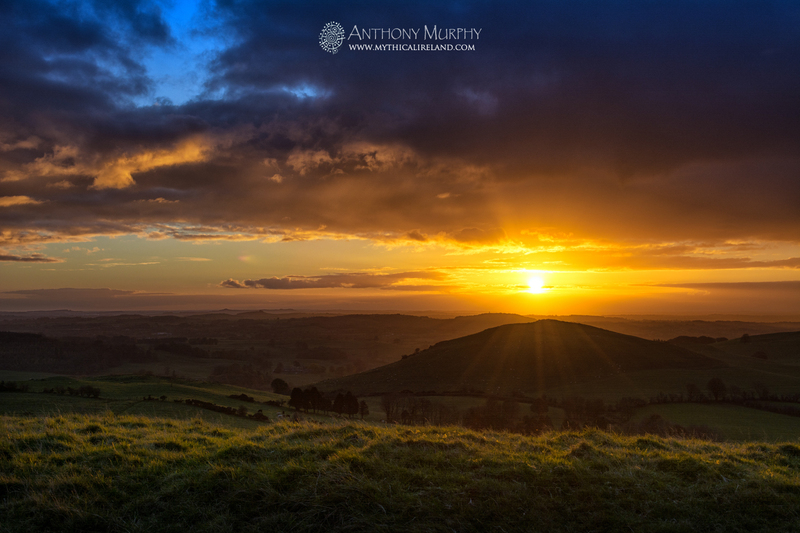 The sun sinks behind Carrigbrack viewed from Slieve na Calliagh. Just to reiterate - at dawn on Samhain, the sun rises out of Red Mountain when one is situated at Cairn L, which is one of the largest cairns in the whole complex, and which has a chamber that faces towards Carrigbrack. At dusk, the sun sinks into Red Mountain when one is situated at Cairn T, also one of the largest cairns, known as the Hag's Cairn. I've put together a simple map to show the alignments. It's based on imagery from Bing Maps, which has much clearer views of the Loughcrew landscape than Google Maps. One of the fascinating things about the Samhain alignments is that the hag in other parts of Ireland is sometimes characterised as the Hag of Winter. The November cross-quarter date appears to have been important in pre-Christian times, although there is some debate about its true antiquity, and whether it was considered important in the Neolithic. Samhain was said to have marked the beginning of winter, or the beginning of the "dark half" of the year (the bright half beginning at Bealtaine in early May). Samhain was considered the principal festival in the ancient calendar. A Samhain pre-dawn view of the breasts of the Cailleach from Cairn L on Carnbane West. It's worth noting too that the hill over which the sun rises on winter solstice when it shines into Newgrange in the Brú na Bóinne complex is also called Red Mountain. 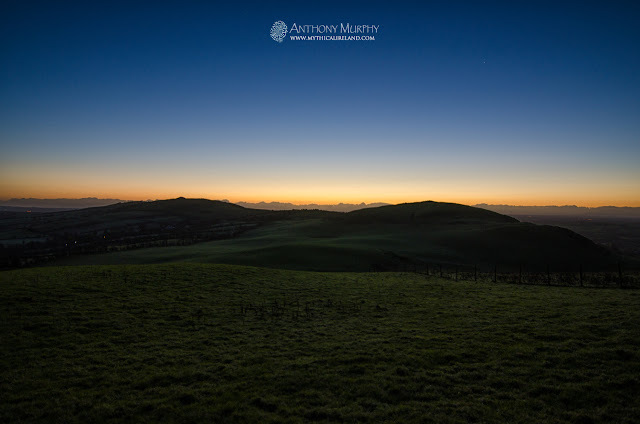 *The four hills of Loughcrew are Carnbane (better known today as Carnbane West), Carrigbrack (Sliabh Rua), Slieve na Calliagh (better known today as Carnbane East) and Patrickstown Hill (the ancient name of which has been lost). In some versions of the creation myth, the Cailleach is said to have jumped on three hills, dropping stones from her apron, and in these versions it would appear Sliabh Rua is omitted. It's not clear why this is. In an old poem, in which the Cailleach is called the Garvoge, the hills are called Carnmore, Loar and Carnbeg. I've created maps of the cairns at Sliabh na Caillighe/Loughcrew, using Bing Maps. The cairns are believed to be older than Newgrange, dating possibly to 3500BC, and were given letter designations by Eugene Conwell, who excavated some of them in the 1860s. The hill known as Carnbane West today was, according to local folklore, known previously simply as Carnbane (from carn bán, the "white cairn"). The hill labelled Carnbane East today was known in the past as Sliabh na Caillighe, the Mountain of the Hag. 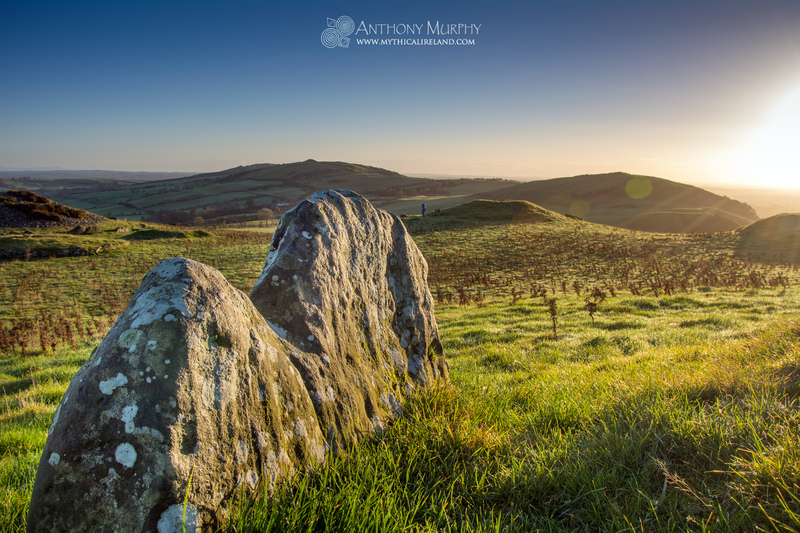 The best known of the cairns are Cairn T, called the Hag's Cairn, which is aligned towards sunrise on the equinoxes, and Cairn L on Carnbane, which is aligned towards sunrise at Samhain (November) and Imbolc (February). For more on the Samhain alignment of Cairn L, see this page. For more on the equinox alignment of Cairn T, see this page. I was extremely blessed to have been present at Cairn L on Carnbane West at Loughcrew this morning to witness a gloriously beautiful Samhain sunrise and the illumination of the chamber of this ancient cairn. I hadn't been to Cairn L in a good few years, and to go there in the pre-dawn twilight, with Orion and Sirius looming above the ancient cairns was really something very special. But what was to follow was one of the highlights of many years of being present at ancient and sacred sites. The above video captures the essence of it, but of course nothing beats being there in person. 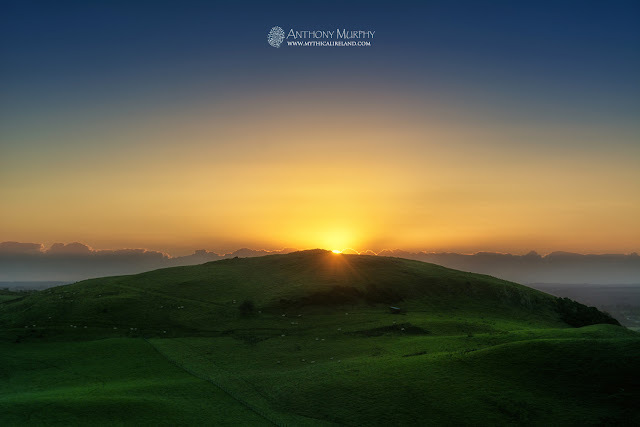 At 7.44am, the sun appeared above the remains of a cairn on the summit of one of the Loughcrew Hills - known as Carrickbrack (from Irish carraig breac, meaning "speckled rock"), and also known as Sliabh Ruadh (Red Hill). One wonders just how ancient some of these place names really are. 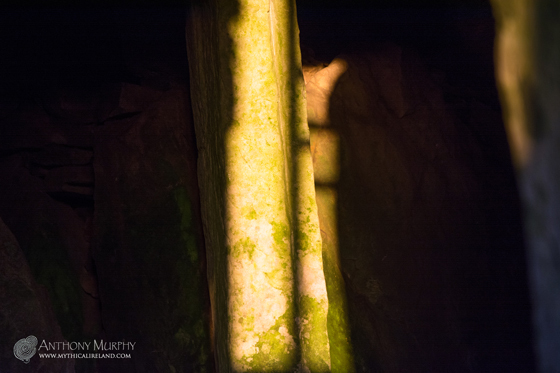 Sunlight enters the passage of Cairn L and illuminates the limestone pillar in the chamber. 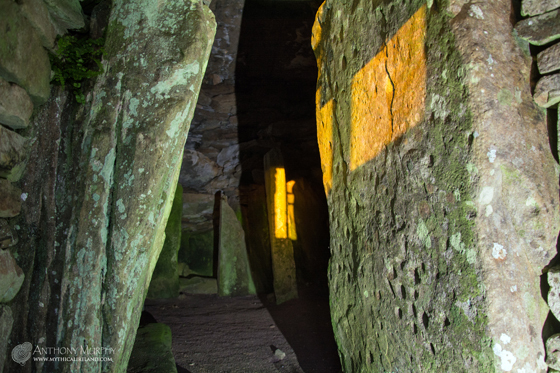 As the sun appeared, its light immediately streamed into the passage and chamber of Cairn L, where it illuminated a limestone pillar in the chamber - a feature that is unique to Cairn L and not found in other ancient cairns with astronomical alignments. The stone pillar in the chamber is lit up by the sun at dawn on Samhain and Imbolc. Martin Brennan and Jack Roberts and their team discovered this alignment in the early 1980s. It is one of many apparent alignments at Loughcrew. The most famous is the equinox alignment of Cairn T (the Hag's Cairn). Although I had been to Cairn L a couple of times, I had never been there at sunrise, and certainly not at Samhain! It was an immense pleasure, and a moment of pure joy and rapture to see the beautiful warm sunlight illuminating the interior of the cairn. The significance of this event is that Samhain was a very important pre-Christian festival, possibly having its origins in prehistory. It was considered the beginning of winter, and as a so-called "cross-quarter" day, it marks the halfway point, measured in days, between the autumn equinox and the winter solstice. 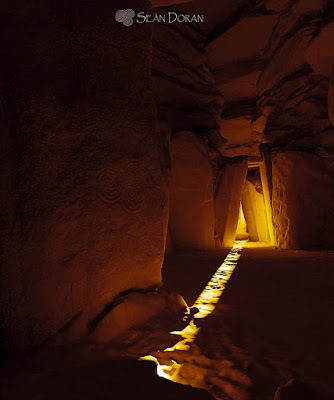 But unlike Newgrange, where the sun shines into its chamber around winter solstice, Cairn L will be illuminated twice - once in early November and again in early February, for the ancient festival of Imbolc, or the February cross-quarter day. 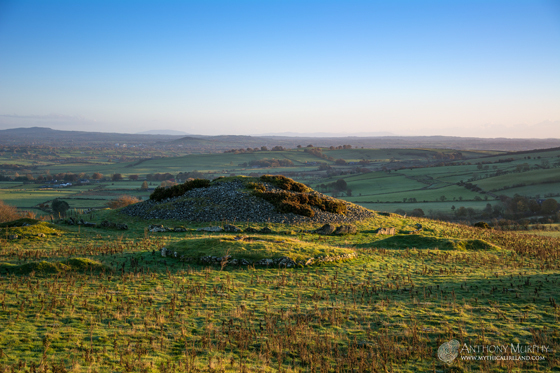 The cairns at Loughcrew were said to have been dropped there by an ancient Cailleach or Garvoge. displayed the wonders of her might. 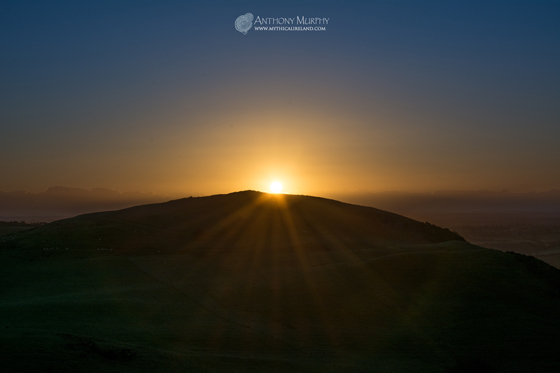 The moment the sun rose from behind the summit of Carrickbrack. One cannot help, while looking out from Cairn L towards the other hills (Carnbane East, which was formerly better known as Sliabh na Caillighe; and Carrickbrack), both of which are topped with cairns, of the Paps of Anu or the Paps of Morrigan, and to see in the landscape the earth goddess herself. Perhaps, if one allows a little imagination, one can think of the breasts and the belly of that great woman, so venerated in ancient Ireland, as the earth itself, topped with these cairns that are attributed to her as miraculous works. Ancient though she may be, the Cailleach will never be forgotten at Loughcrew, because the Cailleach IS Loughcrew. (1) Conwell, Eugene Alfred, On Ancient Sepulchral Cairns on the Loughcrew Hills, Proceedings of the Roal Irish Academy (1836-1869), Vol. 9 (1864-1866), p. 358. Special thanks to Lar Dooley and Ken Williams whose company was greatly appreciated. And to the landowner for allowing us access. 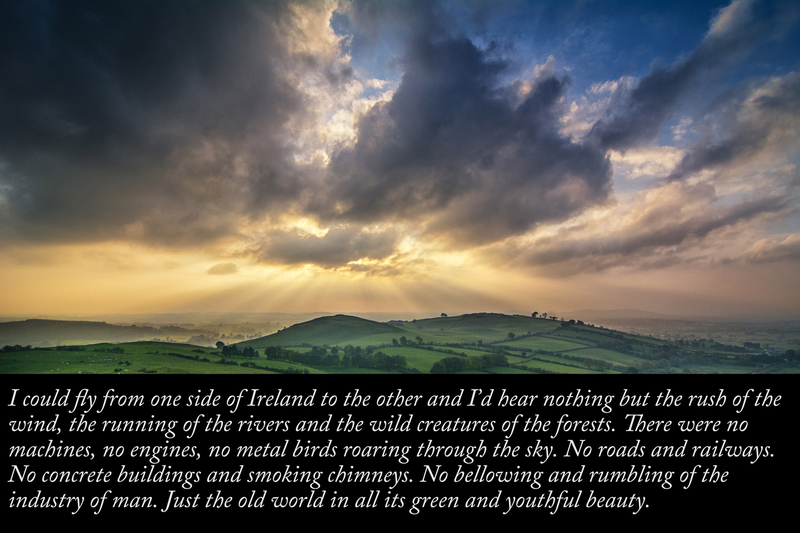 I could fly from one side of Ireland to the other and I’d hear nothing but the rush of the wind, the running of the rivers and the wild creatures of the forests. There were no machines, no engines, no metal birds roaring through the sky. No roads and railways. No concrete buildings and smoking chimneys. No bellowing and rumbling of the industry of man. Just the old world in all its green and youthful beauty. Oh how I long for those days to return. 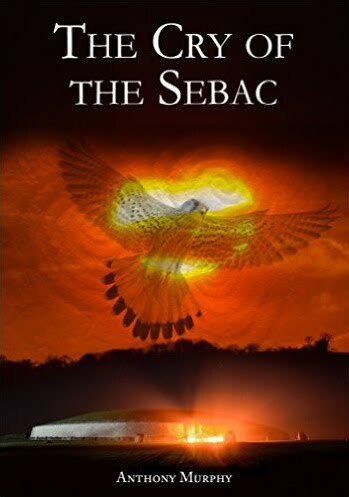 From The Cry of the Sebac, a novel by Anthony Murphy. Available on Amazon Kindle and coming to print soon. I have received good news from The Liffey Press. Newgrange: Monument to Immortality is currently being reprinted, following its recent selling out. 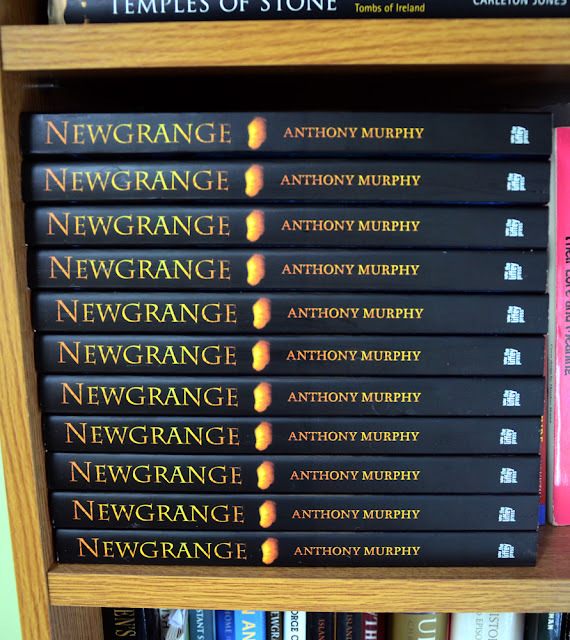 The first edition was published in 2012 and is now sold out. The new print run should arrive at the distributor on 16th November, and so should be available in the shops shortly afterwards. This is the second of my non-fiction books to sell out. Island of the Setting Sun - In Search of Ireland's Ancient Astronomers was first published in 2006 and sold out in 13 months. It was republished as a second edition in 2008 and has since sold out again, but regrettably is not being republished at this time. I would like to see Island being republished as I think it will continue to sell for years to come.